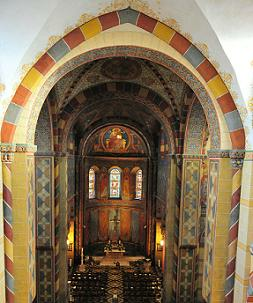 The grand organ in the Kaiserdom, Königslutter, Germany, was built by the firm of Furtwängler & Hammer as No. 286 in the year of 1892. It is a masterpiece of the period, now fully restored to its original state, matching the splendor and majesty of the Imperial Cathedral itself, also fully restored. In this Sample Set Spotlight Review, I've "illustrated my opinions" by inserting links to over 20 recordings that I did on this instrument. Rather than going into more details here about what I used, or what stops I am featuring, the links to each of the recordings will provide the reason that I chose a particular piece, any registrations of interest, or other important information there. 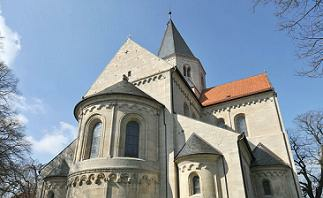 The Imperial Cathedral in Königslutter (Germany) is one of the most important Romanesque buildings in Germany. It was founded in 1135 by Emperor Lothar III as a Benedictine abbey church and burial church for himself and his family. 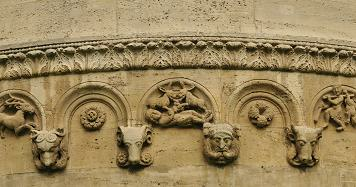 After Lothar's death, the cathedral was completed under Henry the Lion. It is a cruciform basilica of enormous dimensions for that period, measuring about 75 m long and 18 m high. 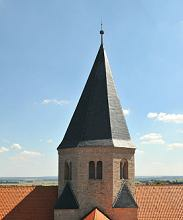 At the end of the 19th century an extensive restoration of the church was decided upon. This also included a new painting of the interior of the church, as the medieval church painting had been painted over with yellow paint. The artistic paintings from this restoration are today considered an important document of the end of the 19th century. 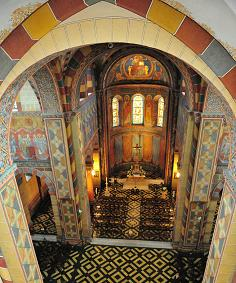 The Imperial Cathedral Königslutter is one of the outstanding Romanesque buildings in Germany. 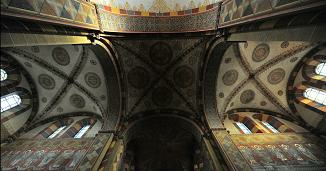 It is considered to be the Saxon counterpart to the Salian cathedral in Speyer. It's origins lay with Emperor Lothar. 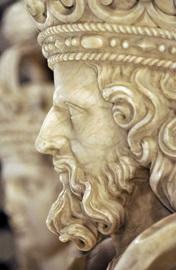 Lothar, born in 1075, came from Saxon aristocracy. His home was the region between Braunschweig and Helmstedt. He is called "von Süpplingenburg" after the ancestral home of his family. His marriage to Richenza of Northeim earned him extensive ownership and power. 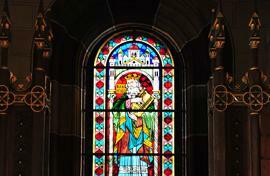 From 1106 Lothar was Duke of Saxony. 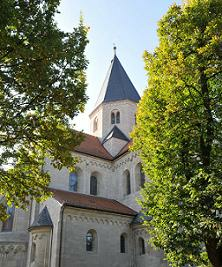 In the summer of 1135 Emperor Lothar III laid the foundation stone for the memorial church of his family and donated a new house monastery, which he occupied with Benedictine monks. The convent headed by Abbot Eberhard came from the monastery Berge near Magdeburg, a center of the Hirsau reform movement in northern Germany. The church was consecrated to Saints Peter and Paul. The imposing appearance of the building, the excellent masonry quality of the eastern parts in particular, the wide vaults in the choir and transept and the Italian architectural sculpture prove the emperor's high standards for his church. In the history of architecture and art, the imperial cathedral has an outstanding position. Due to numerous relics and a supposedly miraculous image of Mary, but especially because of the papal entitlement to grant generous indulgences, Königslutter developed in the Middle Ages into one of the most important places of pilgrimage in northern Germany. 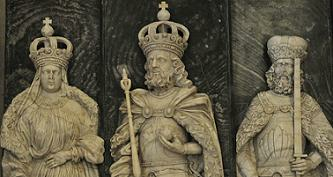 Every year, thousands of pilgrims flocked to the Elm ("Lattersche Fahrt") on Peter and Paul's Day (June 29), the feast day of the two patron saints of the church. Many of them came from far away, from Thuringia, the Rhineland or from the Baltic Sea. At the end of the 19th century, the Kaiserdom was in such a bad condition that renovation was inevitable. When removing the thick yellowish lime paint, which covered all wall surfaces of the interior, medieval paintings were discovered. 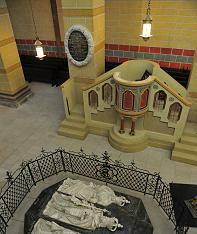 At the suggestion of the regent Prince Albrecht of Prussia, the decision was made to completely redesign the church space, and the contract went to the architect, building historian and museum director August Essenwein (1831-1892), who had made a name for himself through numerous important restoration projects in Germany. On the basis of the uncovered paintings in the choir and in a few other places he developed in the sense of a 'creative' preservation of monuments an overall concept for the remodeling of the interior. The aim of Essenweins was a "stylish" (which I think means "historically accurate") restoration. In connection with the redesign of the interior according to a concept by August Essenwein the furnishings were restored and supplemented at the end of the 19th century. These include the jeweled floor in the East end, the altars, the cross, the pulpit, the doors, benches, pendant lights, song pointer, all window glazing and the organ. 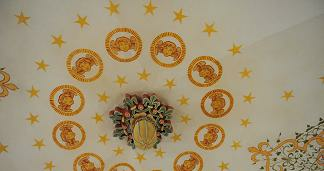 Overall, the decoration and the furnishings of the imperial cathedral represent an outstanding and unique in its historical completeness. In the course of this restoration a new organ was installed as well. This organ was built by one of the leading German organ building firms of the time, P. Furtwängler und Hammer from Hanover. At that time, this company could already look back on a long tradition of organ building. It was founded in 1838 by Phillip Furtwängler,, later his sons took over the business. 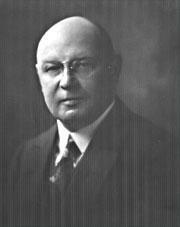 In 1883 the organ builder Emil Hammer became a partner in the company and the name was changed to P. Furtwängler and Hammer. The organ corresponds to the romantic sound ideal of its time. Its sound is characterized by numerous stops in a variety of timbres at 16', 8' and 4' as well as by the typical degressive terrace dynamics, in which the volume decreases from the lower manual upwards. Thus, for most stops there is an equivalent with a graded sound volume in each manual. This enables an almost smooth, "stepless" dynamic climax and anticlimax, which according to the german-romantic tradition is performed using the labial stops. The company Furtwängler und Hammer acquired an excellent reputation through the high quality of its organs, many of which still play today. 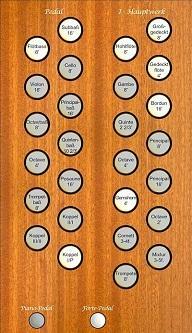 The organ in the Kaiserdom was built in 1892 as Opus 286 and today has 44 stops on 3 manuals and pedal. The key action is mechanical-pneumatic, in the Hauptwerk division a mechanical action controls pneumatic Barker levers, which in turn open the valves of the organ pipes mechanically. This type of action was also used by Aristide Cavaillé-Coll, it allows a very precise and effortless playing, but there is no direct mechanical connection between the keyboard and the valves. This organ is an instrument with a cone valve chest, a typical wind chest construction of the German-Romantic organ building style, in which all the pipes of a stop are placed on a stop-channel and controlled by individual valves. In contrast to the slider chest construction, not only one valve per key is required, but for each stop one valve per key is needed. Hence - in contrast to the slider chest - every single pipe receives the full wind. In the 1940s the German Orgelbewegung negatively altered this instrument along with many others, and some changes were made in order to come closer to the baroque sound ideal prevailing at that time. For example, the Clarinette 8' was replaced by a Krummhorn 8', and the Progressive Harmonica (Mixture) in the Seitenwerk (manual II) was replaced by a baroque Scharff. In 1984 the mechanical action was replaced by an electric one. 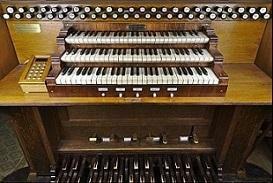 The thing that actually saved the organ was the fact that the building itself had fallen a drastic state of disrepair. The importance of the building led to its restoration, and this, in turn to the saving restoration of the organ. 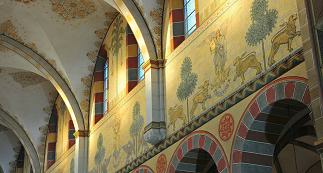 In the 1990s, considerable damage was found to the paintings in the church and an Kaiserdom extensive renovation was planned. The beautiful painting of the 19th century was completely restored to its original color. In the course of this comprehensive renovation of the church in the years 2008 to 2010, the organ was also subjected to a thorough overhaul. 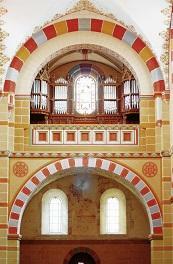 It was restored to its historical sound of 1892 by the organ-building company Hartwig Späth (Freiburg). 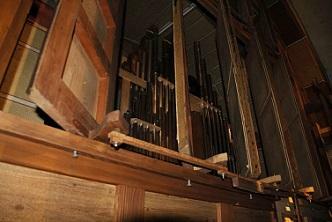 During the electrification of the organ in 1984, the components of the mechanical action had fortunately been stored, so that the original mechanical-pneumatic action could now be restored and reinstalled. Only the largest pipes at the rear remained during the building restoration. The console was not removed. 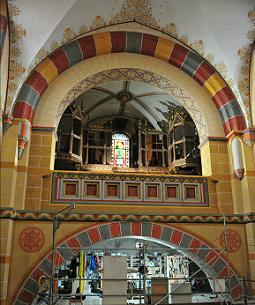 After this restoration, the large Furtwängler and Hammer organ is now considered an outstanding sound monument and one of the most important romantic organs in northern Germany. It is a true "time capsule" and monument of sound. 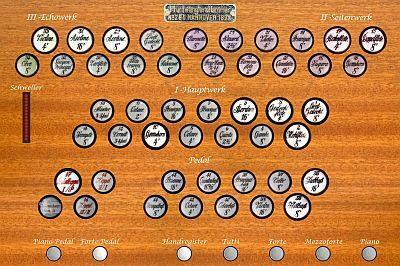 If you are like me, you know little about the Furtwängler tradition of organ building. I do know the name, but not much else, so, let's see if we can come up with some historical facts and insights into the foundation, growth, and advancements of the company. Philipp Furtwängler was born on April 6, 1800. Originally a watch dealer by profession, he soon became a maker of tower clocks. 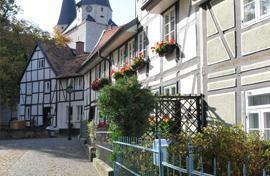 In 1826 he married and settled in Elze, near Hannover. In 1838 he founded the firm Philipp Furtwangler. His marriage contract already mentioned that there were organ parts in repair at his workshop, and these were likely parts for mechanical organs, but with his mechanical talents and interest in the occasional repairing of these clock organs, he found his true calling, and decided to become an organ builder. His interest as a mechanic was so aroused by the occasional repairs that he decided to build the organ and in 1838 his business, Philipp Furtwangler, was registered in the district court at Elze. In 1854, Furtwängler took his eldest son, Wilhelm, into the company, renaming the business as Philipp Furtwängler & Sohn. In 1862, his youngest son, Pius, joined the firm, which was now known as Ph. Furtwängler & Söhne. By the time that Philipp Furtwängler died on July 9, 1867, his business was thriving, employing about 15 men, and highly regarded. Because the line Furtwängler remained without heirs, Pius Furtwängler took the famous organ builder, Adolf Hammer as a partner after the death of his brother William in 1883. It was at this time that the firm relocated from Elze to Hannover. Adolf Hammer was born on April 6, 1854 in Herzberg, and had been an apprentice in the workshop of Furtwängler, where he acquired a comprehensive knowledge. Before he became a partner of the company, he was self-employed in the Wroclaw area. The company was now called: P. Furtwängler & Hammer - Hannover. In these years of flourishing organ construction, new ideas and technologies were adopted and implemented. 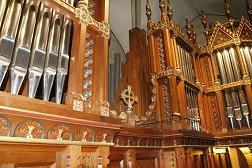 There were organ works with first mechanical, then pneumatic actions. All instruments and structures were built with selected materials and were admired for their lightness and precision. 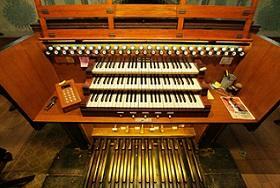 Some of these organs are still in existence, and some still play today: with original action and wind systems. 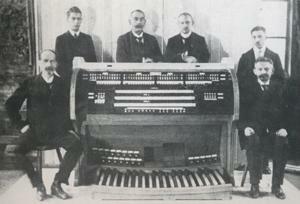 In 1914, the firm built a large organ, which was admired by the experts, and installed in the Stadthalle in Hanover. 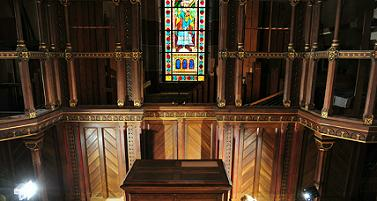 It had 124 sounding stops and 117 individual playing aids, 8225 pipes, and was the largest organ from the firm. Highest recognition was given to the precise tube pneumatics with quadruple staggered wind pressures also to the remote work 30 m away. The technical aspects of the instrument were excellent, had many orchestral effects, and wide-ranging dynamics, from "the most tender ppp to the strongest fff". The organ also featured a large combination mechanism, unusual for the day. Sadly, the instrument was completely destroyed during World War II. In 1937, the nephew of Adolf Hammer, Emil Hammer, was born in Wesermünde, and became the sole owner of the company founded by his uncle. The company name was now: Emil Hammer Orgelbau. Finding an appropriate space for the factory was difficult, but the firm was able to take control of the former ammunition production plant of the company A. Nobel in Empelde, near Hannover. The reconstruction of the first organ works after the war were hindered by extreme material shortages, not to mention the many different views and opinions about the construction of a new organ. Due to lack of material and money, many projects were greatly slowed or even stopped before ever getting started. After the death of Emil Hammer in December 1958, his grandson Christan Eickhoff, born on December 23, 1935 in Shanghai, took over the company - the old company name Emil Hammer Orgelbau, Hannover - remained. After the years of apprenticeship and traveling in Hannover (E.Hammer), Zurich-Maennedorf (Th.Kuhn AG) and Copenhagen (Axel Starup), Christian Eickhoff began his work in 1961 with 25 skilled employees. He first worked in the workshop at Empelde, and continued at Hannover the company engineered by his grandfather. Here, too, the operational processes were cramped, so that they decided to a new workshop, which was moved to Arnum, Hoher Holzweg in January 1966. In 2007, Christian Eickhoff sold the company to the organ construction company Reichenstein. 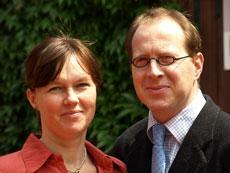 Georg Schloetmann, employed by Orgelbau Hammer since 2004, assumed control of the management of the workshop. After a period of reorganization, the Hammer workshop moved to Hiddestorf in 2008, now occupying the former workshop of the organ builder Franz Rietzsch. In May 2011, the workshop split from the organ construction company Reichenstein, with Malgorzata and Georg Schloetmann assuming control of their own business. Today, in addition to smaller new buildings, the restoration and reconstruction of the organs built by Furtwängler & Hammer is the main focal point of their work. The large organ in the gallery is regarded as an outstanding monument of sound and is one of the most important surviving romantic organs. As already mentioned, a "symphonic sound" can be achieved through the use of many fundamental and string registers. Like the orchestra, the sound continuously increases in volume without significantly altering the timbre. The restoration carried out from 2008 to 2010 by the company Freiburger Orgelbau, Hartwig and Tillman Späth has returned the instrument to its original state, after it had been significantly altered in the 1980s, especially in the restoration of the action between keys and pipes. Now that we've learned a fair and goodly amount about the history of the The Imperial Cathedral in Königslutter and of the Furtwängler and Hammer firm, builders of the important and historic instrument housed therein, let's spend a little time going through each of the divisions. The Hauptwerk, or Great Organ, is rich and full. Not overly aggressive, the sound is dense, but the upper-work adds a good sense of brilliance, but never in a harsh or exaggerated way. The flutes are varied and beautiful, and stops such as the Großgedeckt 8'are very versatile because of their gentle presence. I used it as a solo voice, for accompaniment, and even coupling it to the Pedal, when I wanted a softer 8' sound there. The Principal chorus is clean and appealing, but maintains the romantic idiom that the sound is based upon. A voice such as the Gambe 8' is an outstanding example of this type of stop. It is quite "keen," and can make itself heard as a solo color, and can also be combined with the other 8' stops to make that characteristic "German romantic" sound that works well in many pieces of the period. The 16' stops add a lot of weight, and really support the full sounds. The Trompete 8' is big enough to serve as a solo voice or as a chorus reed, where it really fills out the sound. One of the limitations of this organ is the couplers. Only the Seitenwerk can be coupled to the Hauptwerk, and this is unfortunate, as having the ability to couple the Oboe and Geigenprincipal of the Echowerk into the chorus would really complete the effect, but, such is life! Speaking of the Seitenwerk, it's a very complete "Positif or Choir Organ". Incidentally, when I translate the word "seitenwerk," I get "page factory," so, that can't be right! The Quintatön 16’ is "nasal" as you would expect, and it is certainly not a heavy 16' stop. The Principal is sturdy and with color, and the Fugara is sharp and bright. The Doppelflöte is big and full, and probably the "biggest" solo flute of the instrument, while the Gemshorn is small and delicate, but still nicely defined. The 4' and 2' stops are excellent, with the excellent qualities of versatility. The Nazard balances nicely, and the Harmonieflöte 2' is bright and attractive, but it doesn't "do damage" by being shrill. The Progressiv harm. 2-4fachs functions exactly as you would hope, and adds a nice "true mixture" sound to the ensemble. The Clarinette is a "free reed" and has quite a bit of the sound of a harmonium. It isn't the same as an English Clarinet, but is a wonderfully unique solo voice, once you learn how to "manage your touch" will using it. It can also be used in the chorus, and with the mixture, makes a full and bright chorus for you. The Echowerk is enclosed and has some truly lovely sounds. The Flöte trav. 8' is a wonderful "open flute" and is quite large. It has many uses. The Lieblich Gedeckt 8' is a wonderful "opposite," and can add much in color to any number of the stops in the division. The Geigenprincipal is sweet, but still weighty enough, and the 4' Violine and Zartflöte 4' are excellent. The strings, at 16' 8' and 4' are rich but soft. The Aeoline 8' adds the "celeste" to the Salicional, and it is very fine, although not at all loud. The wonderful Oboe 8' has color and passion, either as a solo or in the chorus. Remember though that this is an "Echowerk" and NOT a Swell! It can not be coupled through to the Hauptwerk, but can be coupled to the Seitenwerk. It is unfortunate that this, and many other German organs of the day, do not have a real "Swell division." However the sounds that this instrument produces, combined with the glorious acoustic, is a BIG compensation! The Pedal is substantial, but basically a "fundamental" division. The Subbaß 16' is round and full, and not soft. The same can be said of the extended Flötbaß 8'. If you need a really soft pedal, you might try coupling the 16' Bordun of the HW, with or without the Großgedeckt 8'. The Cello 8' and Violon 16' are fairly large and a "stringy" in the best sense of the word. The Prinzipalbaß 16' is substantial, but without the true weight of an English pedal. The Oktavbass 8' and Octave 4' are extensions, I think, but work well. The Quintenbass 10 2/3' can do the work of a "fake 32'," especially being somewhat "disguised" in the generous acoustic. The Posaune 16' is large and smooth, with color, but correctly without the "heat" of a French reed. The Trompetbaß 8' goes with it perfectly, and will really fill out the biggest bass lines. The full Pedal is impressive, but is not a "thunderer," which would really be not "fit" into the overall tonal mix, considering the refined and noble sound of the full organ. The only coupler to the the Pedal is that of the Hauptwerk. There are four "presets" or "Trigger Collective Buttons" for: Tutti, Forte, Mezzoforte, and Piano. The registers marked with a * were changed, but were returned to the original condition in the course of the restoration. 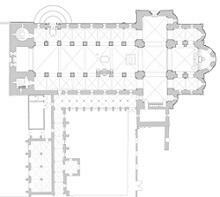 The registers marked with a # were lost, and were recreated according the the original build. In essence, these "new stops" replace the "old ones" that had been removed in the changes that had been made over the years. The use of this instrument in Hauptwerk is easy, and straight-forward without "issues" and without "bugs" to spoil your experience or upset or ruin your day! Also, the set is not a hog in terms of RAM usage, and the quality is of the highest throughout. I believe that some have said that the layout of stops is not as "clear" as it could be, but it is in keeping with the actual console, which simply has two L-O-N-G rows of drawknobs above the keyboards. This is not the elaborate console that we see on English instruments, and even more so on American consoles. There are several layouts to choose from, depending upon whether you use one or two monitors. I use one, so my "selection" and "experience of choosing" is always limited, but the choices are clear, should you be fortunate enough to have two monitors at your console. In addition to the stops, there is a nice virtual console, which is very like the real console. When I first saw the console, I said to Reiner that I thought it would have been better if the "telephone" had been removed for the photo! However, he pointed out that the "telephone" is the "sequencer" used in the "modern" combination action! There is a simple-to-use slider control, which you can use to set your "listening/playing perspective." In almost all of my recordings, my distance is set at "maximum distance FROM the sound." In one or two cases, I think I moved a little closer, but only slightly. I think it is a real credit to the recordings of the real organ and the production of the sample set that there is excellent clarity, despite the vast acoustic and the distance from the direct sound! It was pretty clear from my very first "demo-upload" that this sample set was going to attract a LOT of attention, and from what I've seen, ALL of the attention is positive! The rich and genuine sounds of the instrument, the ease of use and perfection of controls and features, the special colors and gloriously vast acoustical ocean, and a reasonable and highly competitive price, make this a real winner, and if you are looking to add this "type" of instrument to your sample set stable, this is one to DEFINITELY CONSIDER! I extend my appreciation to Pipeloops for giving me the chance to play and review this set. THANK YOU, Reiner! I have enjoyed playing the Furtwängler and Hammer organ of the Imperial Cathedral in Königslutter immensely, and look forward to the pleasure of many more uploads in the future. I did receive a copy of this sample set without cost for my review, but I am not paid for this or for ANY of my Sample Set Spotlight reviews. I think "Seite" has the same range of meanings as "side". "Werk" is "division", so perhaps "side division" is a reasonable translation of "Seitenwerk"? Well, that makes sense, so, maybe that's what it means! What a marvelous review, Dave. Talking of in-depth; could not be better. You have a definite gift for writing as well as playing and this review makes the mouth water wanting to rush out to the keyboard to order the set. Thanks for another in depth organ review. They are very well researched and of value to us. There is another excellent Furtwängler & Hammer instrument in Verdun Cathedral that can be heard on volume 5 of the Priory complete Karg-Elert series. PRCD869. This organ dates from 1916 but escaped the Orgelbewegung movement and remains in original condition. It is 3/54 and has manuals 2 and 3 enclosed. 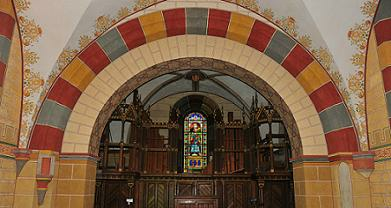 Yet another from 1913 can be heard on PRCD 1063 volume 8 of the Karg-Elert series at Marienkirche in Salzwedel, Germany. At 3/62 this is the largest surviving instrument from Furtwängler & Hammer and after issues from high humidity it was restored in 2007 by the Scheffler Company. Well, I appreciate your saying so. As you know, this one was very hard to "bring together," mostly because of translation issues. I got the set for "free," but I really worked very hard on this one. For one thing, I didn't much about the builder. For another, it was hard to find material, translate it, and then try to make sense of what the translation actually meant!!! After one month playing (in a musical and a toy way) with this sample set, I'm very satisfied ! And the way we can test the complete sample set before buying it or not is very cumfortable. Thank you very much for your enlightening and interesting history and analysis of this organ! Another very well done report, David, thank you for the time and effort you put in these sample set reviews. I wonder what is next on your list, may be the long expected Peterborough Hill Organ, when it will be finally released? I've had no contact with the guys making the Peterborough set, but it appears like it will be high quality. Peterborough is a major organ, and will no doubt have a big impact on lovers of the English sound. Good review but also about where the organ is situated, is history, the cathedrals history and the organ itself. Many thanks for you extensive review, David! You definitely are an expert. Nice of you to say, but certainly not on this beautiful organ. You forgot to mention the wonderful control called "Random Detune"; this is a most useful feature to make the organ sound way more realistic; when set at zero, the organ sounds kind of flat and uninteresting, at least to me, but when the slider is pushed basically between 75% and 100%, the organ comes alive and sounds very realistic. 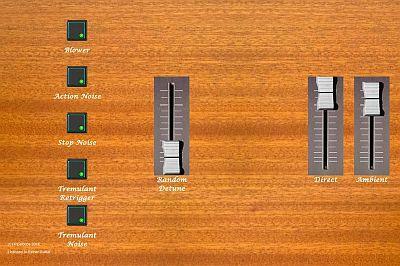 All sample set makers ought to have such a slider! Also, the organ inspires, and when I first installed the set, I improvised like crazy (too bad I didn't record that). The organ keeps on inspiring you; the combination of clarity and acoustics is ideally balanced, and this is a great plus and reveals the skill of the sample set maker in terms of microphone placement, etc. I have also uploaded mostly improvisations of the set to this site for your listening pleasure, as have others. The wonderful thing is that you can try the entire organ before deciding to buy it. When I downloaded the demo, I was hooked. I played it for days before upgrading to get rid of the few seconds of interrupting silence that would occur like every 30 seconds or so. I wish every sample set maker would demo their organs in this way! -A swell for the Seitenwerk. -A direct pedal coupler to the Seitenwerk. Reiner: Can we have still these? thank you for your positive comments about this sample set! One remark I would like to make regarding the tuning slider: When you set Hauptwerk to use the organ's original tuning you probably won't need this feature, as the organ has a natural random detuning, so at the time of the recording it was very well in tune, but not as perfect as Hauptwerk will tune it when you select one of the tempered tunings, e.g. equal tuning. When you do so, the organ gets so perfectly tuned that indeed it sounds flat and dull, and as we all know with multichannel sample sets you cannot use the random detuning built into Hauptwerk, as it will detune front against rear samples of the same pipes. That is why I added that detuning slider to the set, it only provides to a multichannel set what Hauptwerk does perfectly well for a stereo set. I didn't forget it, I just didn't mention it, for the reasons that Reiner has indicated. By the time I finished this review, I really was "informationed-out," so, while I thought about discussing this feature, I never used it, so I didn't mention it. Greetings! Many thanks for posting this very interesting article. This is an organ building firm that I have never heard of before. You have clearly done considerable research. Congratulations and well done. Best regards from Down Under. it is amazing how much background info you were able to find on the building, the organ etc. I know from my own research that not too much material on the organ or organ builders has been published, so this is quite an accomplishment! Makes for highly interesting reading! Thanks again for putting so much time and effort into this and for uploading all the beautiful music! You're always very nice to work with, and I appreciate the opportunity of having the chance to play/review the set. I always try VERY hard to find a lot of information, photos, etc., and I try to really "demonstrate" and "highlight" various "things" about each set that I review. I never "just play what I want," and try to pick things that will enable me to show the instrument off. I wish you GREAT success with sales, and was pleased to be able to do the review! As always, these articles are great background info to know about, so THANK YOU David for all the research and effort you've put into this! I've seen this in a lot of other churches and cathedrals, where these devices rather serve as some kind of "dial pad", which control the hymn book number display showing upcoming hymns to be sung. Not sure whether its purpose is different here, since the virtual HW set does not feature an "internal" organ sequencer. The "phone thing" really is a sequencer that has been added to the organ. I am not sure though whether this has been added with the latest restoration or in a previous modification. There are also two additional foot levers (< and >) to control the sequencer. These look quite different to the other foot levers, and in the sample set they can actually be used to step forward and backward. I decided not to model the sequencer as such though as sequencer functionality is added by Hauptwerk anyway.